Ed has been admitted to practice before the United States Supreme Court, the United States Court of Appeals for the Eighth Circuit, the United States Court of Appeals for the Tenth Circuit, the United States Court of Claims, the Missouri Supreme Court, the United States District Courts for the Western and Eastern Districts of Missouri and numerous other state and federal courts. Ed has been appointed by the United States District Court for the Western District of Missouri to serve on the Federal Practice Committee and the Judicial Commission. He has authored scholarly articles for the UMKC Law Review, the Missouri Bar Journal, and the MoBar CLE Deskbook: Torts. Ed has been awarded an “AV” rating as an attorney, which signifies that he is considered by members of his profession to be an attorney of preeminent skill with high ethical standards. He is a long-time member of the Million Dollar Advocates Forum. Over the course of thirty-five years as a practicing attorney, Ed has developed a national practice representing persons injured on the highways or at work or as a result of an unsafe machine or negligent healthcare. Ed has also represented persons involved in a dispute over a trust or a will. In addition to handling all types of injury claims, Ed has represented business owners as both plaintiffs and defendants in matters involving breach of contract, fraud and other claims. He has represented numerous contractors and construction owners in contract negotiations and construction litigation. Ed has experience in collective bargaining and labor arbitration and has a significant background in municipal law and education law. Nance v. Maxon Elec., Inc., 425 S.W.3d 926 (Mo. Ct. App. 2014). Nance v. Maxon Elec., Inc., 395 S.W.3d 527 (Mo. Ct. App. 2012). Cox v. Generac Power Systems, Inc., 2009WL1310417 (W.D. Mo. 2009). iNet Directories, LLC v. Developershed, Inc., 394 F.3d 1081 (8th Cir. 2005). SmartText Corp. v. Interland, Inc., 296 F. Supp. 2d 1257 (D. Kan. 2003). 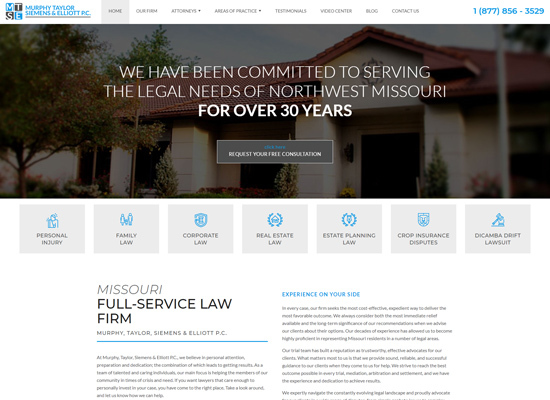 Marketing Services, Inc. v. EA Architects, Inc., 62 S.W.3d 607 (Mo. Ct. App. 2001). In Re Fleming Co., Inc., Contract Litigation, 2001 WL 36386212 (W.D. Mo. 2001). Larry’s United Super, Inc. v. Werries, 253 F.3d 1083 (8th Cir. 2001). Gillespie v. St. Joseph Power & Light Co., 937 S.W.2d 373 (Mo. Ct. App. 1996). Sherlock v. Quality Control Equipment, Inc., 79 F.3d 731 (8th Cir. 1996). Benner v. Johnson Controls, Inc., 813 S.W.2d 16 (Mo. Ct. App. 1991). Powell v. Kovac’s, Inc., 596 F. Supp. 1520 (W.D. Mo. 1984). EEOC v. Affiliated Foods, Inc., 1984WL980 (W.D. Mo. 1984). State ex rel. Dunn v. Schoenlaub, 668 S.W.2d 72 (Mo. 1984). Ed Murphy was raised on a farm in northwest Missouri. He competed in high school and collegiate athletics and played rugby while attending Oxford University. Following law school, he clerked for the Hon. Forest Hanna, retired Judge of the Missouri Court of Appeals. Over the years, Ed has made community service and church a priority. Through his leadership as a Board member of the William D. Morgan Charitable Foundation, millions of dollars have been distributed to local charities and schools. Ed was elected three times to the St. Joseph Board of Education and served as its President. He has also served in leadership roles in his local church, including Chairman of the Church Council and leader of the children’s ministry. Ed has volunteered thousands of hours as a coach and sponsor of youth sports from preschool to high school. He formerly coached AAU girls and boys basketball teams in international competitions in England, Ireland, Bermuda and Hawaii, and his teams won various international, national and regional titles. Ed and his wife, Cheryl, have three adult children.